If your family (4 persons) is together quite often in your vehicle, especially on road trips or driving vacations or long commutes to school and work, you'll have peace of mind knowing that you are prepared for an emergency that might occur in your car. All items are packed in a Large Wheel Bag. This large duffle bag features multiple pockets and wheels for easy mobility. Individual components are placed in waterproof bags and neatly organized in the wheel bag for easy access. 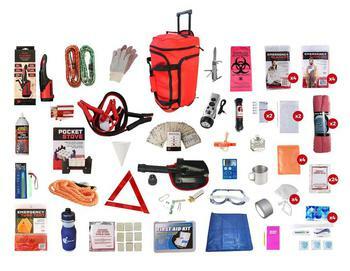 Never be stranded without these essential items in the trunk of your car! Hand-assembled in the USA.